If you are a 38 year old woman, 5’7″, 135 pounds your BMR is 1,325 calories per day. If you are lightly active then multiply 1,325 X 1.375 = 1,822 calories per day. So if this woman eats 1,822 calories, of good food, then she should stay at the same weight. If she wants to lose weight then consume fewer calories. There is an old number that one pound of fat is equal to 3,500 calories. So excepting many variables, if you reduce your food intake and increase exercise for every pound of fat you lose it is the result of 3,500 fewer calories eaten. This 3,500 calories per pound is for just fat. In reality you’ll also lose water, and lean muscle mass. If you are exercising you would increase muscle mass and lose fat. So many variables but if you eat less than you burn, you will lose weight, exactly how much is hard to calculate. Foods that won’t spike your blood sugar are lean meats, fish, vegetables, nuts, seeds, some fruit. So if your diet is free of high glycemic foods and you eat fewer calories than you burn, then it is easier to lose fat and you’ll be on your your way to your goals. Knowing how much to eat is easy, tracking what you actually eat is much tougher. There are many phone and web apps that let you track the foods you eat daily plus add in the exercise you do, so you have an idea of where you stand in your daily goals. Personally I like the MyFitnessPal app. It has many foods plus you can scan the barcode on a package and pull that food into your daily diet. It also remembers what foods you’ve eaten, so it is easy to find foods your eat often. You can also create recipies, so put in how many servings, add the ingredients, then save it. It also syncs up with many activity trackers, so if you have your FitBit on and go for or use another phone app for tracking your runs, it will pull those calories in as well. Healthy Juicing Magazine has published one of my blog posts. If you have an iPad, check out Healthy Juicing Magazine on the Newsstand: https://itunes.apple.com/us/app/id569295045?mt=8. We were featured in the latest issue. When your doctor writes you a prescription is it really for your health, or the financial health of a pharmaceutical company? You’d think that your doctor would do what is best for you, but in many cases they guidance they get from the FDA and the medical community is biased and based on the wishes of the pharmaceutical industry. Take for example diabetes drugs. in 1997 a group of experts met with the american Diabetes Association and modified the definition of what type 2 diabetes is. With that one recommendation all of a sudden 1.9 million Americans suddenly had type 2 diabetes. The same thing happened in 2003 where they change the definition of pre-diabetes and all of a sudden 25 million people had pre-diabetes. In the years that followed they found drugs that could treat pre-diabetes if exercise didn’t work. Sadly for many people they’d much rather take a pill than exercise. So with those changes in how a “Disease” is defined boosted diabetes drug sales to over $23 billion last year. Now why would you want to lower your blood sugar? Wouldn’t it be to reduce heart disease, stoke, loss of limbs, or blindness due to diabetes? Well of the 30 new diabetes drugs intruded in the past decade none was tested to see if it lowered the risk of any of the side effects of diabetes, they only lowered the blood sugar level. Worse yet some of the side effects can be dangerous. In one investigation they found 3,300 cases where these patients died from the side effects of the drugs and another 20,000 were hospitalized. Yes, diabetes is a serious disease and increasing at epidemic rates. Rather than focusing on reversing the disease there is a who economy around diabetes drugs which is fueled by organizations and doctors with financial ties to drug companies. this was found by MedPage Today and the Milwaukee Journal Sentinel investigations. The organizations that lowered the diabetes and pre-diabetes thresholds each received millions from drug companies. In one instance 13 of 19 members of a committee were paid more that $2,000,000 each in consulting and speaking fees by the companies that make the drugs. This is a way drug companies frequently funnel money to doctors and other organizations – They pay them to speak and industry meetings and to lend their expert consulting advice to the drug companies. This isn’t just a problem for diabetes drugs, but for many drugs. Take statin drugs for cholesterol control. Every couple of years the the healthy cholesterol target level is lowered, and in the stroke of a pen (or keyboard) millions more people are put on statin drugs like Lipitor, Crestor, Zocor and many others, and with that billions of dollars flow to the pharmaceutical companies. They say there is no cure for type 2 diabetes, yet for many people those who begin exercise, lose weight, and greatly reduce their junk food consumption, they can get off of diabetes drugs and insulin injections. Unless you’ve been on a deserted island (without WiFi) for the past decade you know there there has been hundreds of research papers published linking increased vitamin D levels to helping to prevent, or cure, everything from the common cold to cancer – and yes osteoporosis in post menopausal women. So why would the medical community recommend doctors stop screening for vitamin D levels? It is probably a case of follow the money. The FDA is heavily supported and funded by the pharmaceutical industry. Many of the FDA executives are retired pharmaceutical executives. Pharmaceutical companies also help support medical schools and give MDs great incentives for prescribing their drugs. So where is the link? If everyone had adequate levels of vitamin D from a very early age through life there would be far fewer cases of many degenerative diseases including cancer. What that means to the pharmaceutical industry is that far fewer people would be needing their very expensive and very profitable drugs. Yes there is a cost to doing the tests, but the cost of dozens of blood tests is far less expensive than one months worth of chemo treatment. Even look at the common cold and flu. What would the savings in lost man hours due to sick days from the cold and flu? Probably billions of dollars per year. Vitamin D supplements are also very inexpensive. So with the vast amount of research on the benefits of maintaining vitamin D levels above 50 ng/ml that potentially will cost the pharmaceutical and medical industry billions. If you live in North America you will need to supplement with vitamin D as the sun isn’t strong enough for much of the year to stimulate natural production of vitamin D.
So in the name of maintaining stock prices, which needs profits, the pharmaceutical industry would rather have us ill and using their products vs. healthy. Before you scream the evils of capitalism and profits, look at your retirement portfolio and your 401K. I’m sure you have many pharmaceutical stocks in your portfolio. Do you want your portfolio to go up or down? Up of course, so you want the pharma companies to do all they can to increase sales, which this is an example of. So do get your vitamin D tested, and invest in companies other than pharmaceutical companies. Now that the temperature is dropping and the flu and colds are kicking into gear, here is a tasty immunity soup that will warm you up and provides a ton of immunity boosting nutrients. – It might even be more powerful that Grandma’s chicken soup! We make a large kettle, then put it in the fridge to enjoy for a few days. Prep time is about 30 minutes, but if someone helps with the chopping and dicing, then it goes much quicker. In a stockpot over medium-high heat, add oil and swirl to coat the bottom. Add jalapeno, ginger, garlic and scallions. Saute until aromatic, about a minute. Add shiitakes and saute 2 minutes, until softened. Add stock and soy sauce, bring to a simmer and reduce by 20%, about 5 minutes. Add lemon juice, tofu and carrots and cook gently for 2 more minutes to heat tofu through. Season with black pepper. If you live in Colorado or Oregon I’m sure you’ve had enough of the political ads against GMO labeling, but why all the fuss? First, what are GMOs? GMO is Genetically modified Organism. Companies like Monsanto, Dow, and others have modified the DMA of corn, soy, and other crops to benefit the growers so they can grow more with less labor. So that sounds good right? If you planted GMO corn in your back yard next to conventional corn you probably couldn’t tell the difference and there may be no real difference when it is on the table. The danger comes when it is commercially grown. There are two basic types of genetic modifications they’ve made to the corn, soy, and other plants. Can you imagine growing thousands of acres of corn or soy and having to manually weed the crop? Thousands of man hours of grueling work walking up and down rows pulling weeds. So one type of genetic modification is to make the plant resistant to herbicides like Monsanto’s Roundup weed killer. So now rather than pulling weeds they can spray the fields with toxic herbicides like Roundup and kill the weeds, but the GMO corn/soy won’t be affected by the poison. Still doesn’t sound that bad. But when you look at the crop that has been doused with poison it doesn’t kill the corn/soy, but it takes it in and absorbs it. So when they harvest the corn/soy all that Roundup is in each kernel or bean and it ends up in the food you eat. Go to Home Depot and pick up a bottle of RoundUp and read the precautions label. That is in your corn on the cob and in your kids breakfast cereal, and in the foods sweetened with corn syrup. Just recently the FDA approved another GMO crop which can withstand a combination of Roundup and Agent Orange. If you remember the Vietnam war, Agent Orange was sprayed on the jungle to kill the foliage. It also had severe health impacts on the troops on the ground. A good friend was a helicopter pilot there and is now a type1 diabetic because of the agent orange. The other type of genetic modification is to have the plant produce its own insecticide. So rather than having to spray the corps with bug kilers, the plant produces its own and kills the bugs when they eat the plant. So eat the crop and you’re eating insecticide. The one ad here in Colorado says there are already Organic and Non-GMO Labeling laws, but these are voluntary. Only if a company wants to say their food is GMO they can – which no company will. So why are the major food producers, growers, and chemical companies spending billions to fight GMO labeling? Because if they had to admit what is in their foods, then many people would switch to non-GMO products. Now you can’t tell. Even if it says No GMOs, or Non GMO, or All Natural, it still has GMOs. Look at a very recent Consumers Reports study where they found that virtually everything includes GMOs unless it has the Organic Seal or the Certified Non-GMO seal. So please research the facts and really understand the truth behind GMO labeling, then cast your vote. In Colorado is it Prop 105 – Please vote Yes. In Oregon it is Measure 92 – Please vote Yes. Non GMO Project. This is the organization which provides Non-GMO verification for food products so they can bear the Non-GMO logo. This has pages on describing the types of GMO produce. Earth Open Source – This has a good paper you can download which reviews much of the safety research on GMO foods. Roundup Ready Controversy – This is published by MIT. It is factual and fairly neutral. Environmental Sciences Europe – This is 2 year rat study which is what Monsanto published to get GMOs approved, but monsanto only ran the study for 90 days vs 2 years. In the conclusion they list the ailments seen in the rats – in general a two to three fold increase in mortality. Food & Water Watch – Agent Orange Ready Corn – This lists the dangers of Agent Orange. GMO Answers – To give fair balance, this is an industry site (Monsanto, food manufactures, etc) so the information is very pro GMO. Manufacturing.net – This is a news outlet for the manufacturing industry, including foods. They have a good writeup on who is funding the anti-GMO labeling campaigns in Colorado and Oregon and why. 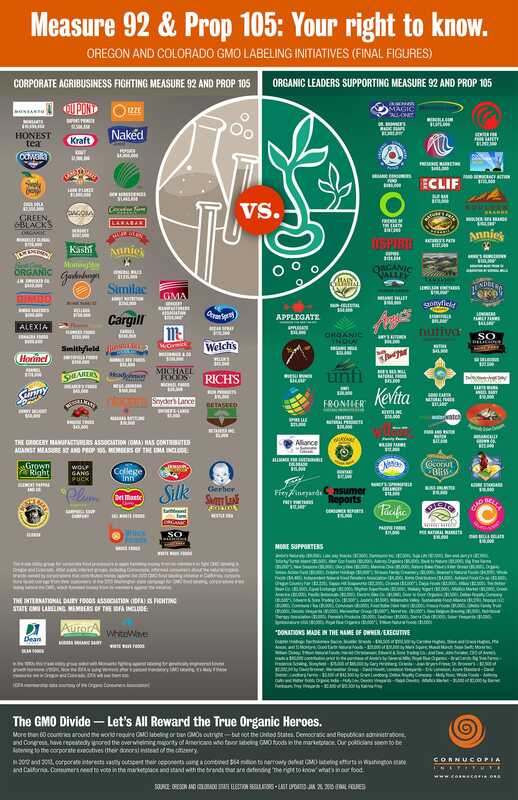 Graphic of who has contributed to each side of the GMO labeling campaigns – This is a great graphic by the Cornucopia Institute of which companies and organizations have contributed how much to both sides of the GMO labeling campaigns in Colorado and Oregon. Dr. Myron Wentz, internationally recognized microbiologist, immunologist, and pioneer in the development of human cell culture technology and infectious disease diagnoses, holds a bachelor’s degree in biology from North Central College in Naperville, Illinois, a master’s degree in microbiology from the University of North Dakota, and a Ph.D. in microbiology and immunology from the University of Utah in Salt Lake City. As many of you know, the name USANA is a combination of the Greek and Latin word roots that means “true health.” When USANA was created more than 20 years ago, we wanted a name that would express the critical importance of nutrition for developing and maintaining a healthy body and mind. I believe then, as I do today, that optimal nutrition is by far the most important thing you can do to achieve long term good health. That’s why I want to revisit the subject of the importance of optimal nutrition, especially the critical need for supplementation in our modern society. My early mentor and later colleague, Dr. Linus Pauling said, “You can trace every sickness, every disease, and every ailment to a mineral deficiency.” And that goes for vitamins and most other nutrients as well. In fact, the World Health Organization considers under nutrition to be the single greatest threat to our world’s public health. Deficiencies of the essential micronutrients have serious health effects for all age groups such as the 14 million children in developing countries suffering a loss of vision due to a deficiency of vitamin A. 500- to 600,000 of those children go blind every year. And half of them will die within a year of losing their sight. We need nutritional supplementation more today than ever before. Since the start of the industrial revolution two centuries ago, we have made our environment, the world we live in, unfriendly to most forms of life. The air we breathe, the water we drink, and the soils we use to produce foods all have greater amounts of pesticides, heavy metals, and toxic synthetics than ever before. However, the correct nutrients in the proper amounts can protect you from today’s toxic environment . The problem is almost all of our nutrition comes from one place: Food; our three square meals a day. Unfortunately today’s food is not what it used to be. There are two major problems. First, what’s not in it. And second, what is in it. What do I mean by that? Well, to begin with, most of our foods are provided to us by a food industry that puts profits ahead of the customer. The problems begin on the farm where intensive industrial farming has been implemented to maximize output such as monoculture and the overuse of artificial fertilizers which supply only a few of the elements that support life. In this practice, there’s far too little concern for the health of the soil and the true nutritional content of the vegetables, fruits, or meat products. All around the world our soils have been depleted of nutrients that were built up over hundreds of thousands of years. The nutrition rich topsoil needed to grow our food is disappearing at an alarming rate. Agriculture authorities at the United Nations estimate that we are exhausting the nutritional elements of the topsoil at rates up to 100 times faster than it can regenerate. In a misguided attempt to compensate for this wholesale abuse of the soil, billions of pounds of fertilizer are dumped on crop lands every year. But they generally replace only three nutrients: nitrogen, phosphorus, and potassium. We need many other elements and compounds about 40 of them to enable ourselves to function properly. We need them in our diet. They cannot be made by the body. When foods are deficient in important nutrients our bodies end up substituting them with similar, but less functional or even harmful non-life elements, and incorporate them in ourselves and tissues in place of the nutrients they need. For example, radioactive strontium will be taken up by the body to make up for a calcium deficiency. Likewise, when we’re deficient in healthy fats, the cells will substitute them with unhealthy trans fats. And an even greater problem than nutrient depletion from the soil is the amount of nutrition lost from food products during harvesting, transportation, storage, and processing. Some crops are harvested before maturity in an attempt to have supermarket produce achieve a longer shelf life. Those fruits and vegetables may last longer, and look better, but they haven’t been allowed to develop their full nutritional value. The next step, getting food from the farms to the people contributes further to the loss of nutrition. Most of us now live in large cities, far from the farm. That means fresh food must travel across the country and in many cases, around the world. Of course, when food spends that kind of time in transportation and storage, it also means the additional loss of nutrients. Then, there is food processing. It makes the job of the merchandiser much easier, but comes at the expense of the consumer. Processed foods may be easier to ship and have a longer shelf life, but so many nutrients are left behind in the factory. So is most of the taste. A recent study from Canada compared a range of staple foods including potatoes, tomatoes, bananas, apples, onions, broccoli and more, finding nutrient losses in all of it. Over the past 50 years for example, the average potato has lost 100 percent of its vitamin A, 57 percent of vitamin C and iron, 50 percent of riboflavin or vitamin B2, and 28 percent of calcium and 18 percent of thiamine or vitamin B1. Now, let’s bring that food from the store to the kitchen and begin to prepare a meal. Cooking results in further loss of nutrients with reductions of 25 percent or more. It is a wonder that any nutritional value is still left in our food when it finally lands on our plate. What I’ve told you thus far is only a quick overview of what’s not in our diets; what used to be there, and should still be there today. But there is a second and perhaps worse problem: Chemicals and toxins in the foods we eat every day. That’s right. One aspect of our daily lives that we hope would protect us and keep us healthy turns out to be another hazard. Our bodies are forced to cope with increasing amounts of toxic chemicals; a misfortunate result of today’s industrial farming procedures. Take pesticides. Billions of pounds 25 billion dollars’ worth annually are dumped on our food crops. Over the past two decades we’ve been told that the adoption of genetically engineered crops has resulted in the decreased use of herbicides and in insecticides. However, more recent reports indicate that’s not true. In fact, the rise in genetically modified food crops is leading to greater applications of both herbicides and insecticides, not less. Unfortunately, that is only the beginning of our exposure to toxins. All around you, in the clothes you wear, in the couch you sit on inside your home, and even in the car you drive, every year the toxic sources increase. But the threat of everyday toxic chemical exposure in your home, on the job, and sometimes at the place you go on vacation is only part of the story. More than a decade ago, an environmental survey group tested the blood of some Americans. What was found? A total of 287 toxic chemicals in those blood specimens with individual test subjects averaging 200 toxic chemicals each. Of the toxics found, 28 of them were waste products, waste byproducts such as dioxins and furans from pesticides. In addition, they found 47 toxics from consumer products such as Teflon and flame retardants. Most serious was the detection of industrial chemicals and pesticides that were banned more than 30 years ago. Many of them directly associated with cancer, birth defects and infertility. But these test subjects didn’t get those toxic substances by consuming the food, air, or water around them. They couldn’t have because they were all newborn babies. Precious brand new in this world for only hours. The blood tested was taken from their umbilical cords. The toxins came from the nourishment received from their mothers, the only food those babies had ever known. Here perhaps more dramatically than in any other stage of life is where the difference between how we used to live and what we face today is best demonstrated. As proven by the blood specimens, we see that a mother’s body is not capable of protecting its baby from the toxic chemicals it is exposed to today. We no longer live in a world where a healthy diet is all you need to ensure good health. As Dr. Weaver so eloquently described, we are surrounded by toxic substances psychological as well as physical and stress. Today, more than ever, our bodies need more assistance, more protection, and more nourishment even before birth. From the changes in the earth’s soils, to how our foods are obtained, and through the characteristics of living in a modern society, we see the results of humankind’s power to degrade the environment he lives in. Often it seems like it’s a problem of society itself; too large for us to change. However, the blame for inadequate nutrition cannot be placed solely on others. In many cases, poor nutrition is largely a matter of bad lifestyle choices. We know what foods are most nutritious, but because we’re too busy or don’t have enough time, we opt for convenience instead. When diet researchers asked almost 2,000 adults what the most important consideration was in choosing lunch, convenience and taste ranked well above health. In fact, health ended up dead last. Convenience was 34 percent, taste was 28 percent, cost, 21 percent. Health, 17 percent. Ultimately the most important factor in living a healthy lifestyle is, of course, you. The USANA supplements can provide you with the most effective solution to give yourselves all and I mean all of life’s essential micronutrients. But it is only when you make them part of your everyday living routine that the power of those nutritionals is realized. Doing that is up to you. All of you can be thankful that you’ve taken an important first step by becoming a member of the USANA family. From USANA’s very first days, I knew it would be an uphill climb to stand up against large, well-funded groups, organizations only interested in simply maintaining the status quo. That is why we all join together today, ignited toward a greater good. Because after two decades USANA continues to show the world that the quality of our lives doesn’t have to be dictated by the food industry, by industrial farming, by the pharmaceutical industry, by your own government or those in the biomedical community who insist that supplementation is of little or no value. To this day, I still remember when the USANA Essentials were introduced. The relentless criticism saying that supplements result in nothing more than expensive urine or that higher than recommended daily allowances of some nutrients like antioxidants failed to improve health and may contribute to illness. Those critics and doubters, they are still around and they are still wrong. Time and again, time and again, we hear the objection that there are no trustworthy scientific studies that show supplementation providing real health benefits. USANA family, that is not true. There are in fact thousands and thousands of credible studies that prove the benefits of micro nutrition. Every year thousands of medical journal articles are published on the various benefits from vitamins and minerals. In just one year, 500 to 600 articles were written on vitamin E alone. And about that same number focused on vitamin C. You can read benefit after benefit that comes from the world of micronutrients. One particularly interesting report compared a group of hospital patients, those who did follow a regimen of daily supplement consumption, and those who did not. As I’ve said many times before, daily supplement support a complete and varied diet to promote long term good health. It is when your body needs that supplement, when your body needs help that supplements are of their greatest value. Now, as members of the USANA family, you know that you receive the highest quality, most effective, nutritional products available anywhere. With that knowledge, so imagine how much better those results would’ve been if all those patients had been using USANA nutritionals. So here we are together, facing a challenging living situation. Depleted soils, nutrients removed during food processing, exposure to hundreds of toxics from synthetic products, nutrient depletion by pharmaceutical drugs and much, much more. Now we have a clear picture of why it is so important to give people the opportunity, the opportunity to choose optimal nutritional supplementation. USANA was created to give this opportunity to everyone. Our purpose has never wavered. Everything we do at USANA helps you love life and live it. We design, develop, and manufacture the highest quality nutritional supplements that contain the right ingredients, supplying all and again I mean all of life’s essential nutrients in the correct forms that provide maximum viability, absorption by the gut, and in the appropriate amounts to ensure proper balance, since an excess of one nutrient can create a deficiency in another. You can be proud of your USANA nutritionals. But today’s USANA essentials and optimizers are not the same products that were introduced in 1992. Every year new discoveries in biomedical science are made. Science discovers new ways to look at things and we strive to find better ways in providing the best nutrition possible. What has not changed is our basic knowledge of what makes for a healthy cell. It is the same message USANA has always had: Quality, efficacy, and completeness are essential. And product choice allows you to design a nutritional program that matches your lifestyle. Because the environment has been poisoned and degraded in so many ways, you must supplement your diet with those difficult to obtain nutritional elements; to replace what’s been eliminated from foods during processing, transportation and storage; and to provide proper adequate anti-oxidant protection from cellular oxidative damage. Again, let me say, the most important factor in living a healthy lifestyle is you. Can You Get All Your Nutrition Only From Food? All your life you’ve eaten a “healthy” diet. You’ve followed the USDA Food Pyramid from the beginning, and were always told supplements were unnecessary as long as you ate a balanced diet. Maybe you’re wiser now, and are following a higher nutrient diet. Either way, one of the most repeated beliefs among health conscious people is that you can – and should – get all of your nutrients from food. With over half of the nation consuming a multivitamin, this isn’t a universal belief. However, multivitamins often make people think they can eat even worse, which isn’t exactly productive. I have the running argument with my in-laws – They are 86 and 92 say they are perfectly healthy, and they never took supplements. Perfect health is debatable, they have the degenerative diseases which are “Normal” for their age. The real difference is that they grew up in a time when their food was grown by the local farmer and cows ate grass, pigs foraged for what they could, chickens scratched for seeds and grubs, and produce was fertilized with manure. They walked 6 miles to school and work through the snow. They played outside. farmers didn’t have herbicides and pesticides. They tended the crop by hand pulling weeds and removing sick plants. The nutrient content of their food then was far superior to what we buy in the local grocery store. If you’re under 50 though, your childhood and young adult diet was far inferior to my in-laws unless you grew up on a farm or in a Greek fishing village. Grains, farm raised meats, and processed foods are not food. The purpose of consuming food is to nourish the body and mind. These foods do the opposite. First of all, grains, legumes, and conventional dairy are nutrient deficient (or void). They contain extremely small amounts of nutrients, most of which are poorly absorbed. Grains and legumes deplete nutrient stores and interfere with nutrient absorption. They are toxins in themselves, which increases your nutrient needs. Grains and legumes both cause intestinal damage which further decreases your ability to absorb nutrients. Even if you’ve stopped eating these foods, you may be in nutrient debt or have lingering intestinal damage which is interfering with nutrient absorption. Due to inflammation caused by other foods toxins, farm raised protein is often inflammatory. Conventional dairy also contains mycotoxins which are extremely damaging. Improper farming practices deplete the soil of nutrients. When plants are repeatedly grown on the same land, the soil loses nutrients faster than they can be replaced. Over time, the plants have fewer nutrients to grow. Fertilizer contains just enough nutrition for the plant to survive and grow large until harvesting, but not enough to support human health. This results in plants that have 75% fewer micronutrients. In addition, most plants are not harvested fresh. They sit on trucks, shelves, and counters for weeks before being eaten. Over time, the nutrient content of these plants decreases. Most modern fruits and vegetables are grown to increase their sugar content and weight (water), not their nutrient value. As a result, most of the common fruits and vegetables are artificially high in fructose and sugar and lower in key nutrients. When plants contain fewer nutrients, the animals that eat these plants are also malnourished. A study published in the Journal of Nutrition and Health found copper levels in the UK have dropped by 90% in dairy, 55% in meat, and 76% in vegetables. Selenium is another one. In many areas of the world the solid is totally devoid of selenium. If the nutrient isn’t in the soul it won’t get into the plant, your not going to get it when you eat it, or an animal that ate from that depleted soil. Fertilizer is routinely applied to crops, but most fertilizer contains only nitrogen, phosphorus, and potassium. These are key nutrients to plant health and growth (Nitrogen for leaves, phosphorus for strong roots, and potassium for overall cell wall strength.) So they grow lush healthy looking produce, but aside from these three nutrients, they are seriously lacking the other 40+ vitamins and minerals we need to support our life. Water is also depleted of minerals due to modern production methods. There is a huge variation in the mineral content of bottled and tap water, with tap water generally having more. Water filters remove important minerals such as magnesium, which was a main source of magnesium for early humans. If you don’t use a filter and you don’t have a well, it’s likely you’re consuming dangerous amounts of fluoride and/or are deficient in magnesium. This could explain why people who drink water higher in calcium than magnesium develop more myocardial infarcts and ischemic heart disease. I know this is a crazy idea, but starving yourself is bad. Consuming a low calorie diet means you’re consuming fewer total micronutrients. Humans are designed to consume a large amount of calories, and it doesn’t make you fat. When you eat less (as everyone says you should), it’s easy to become malnourished. When you’re consuming low quality foods, you have to eat even more to obtain the right amounts of nutrition. This is one more example of why food quality matters. I see people go on diets and obsess over calories. They’ll eat a 100 calorie snack of rice cakes, crackers, etc. They might as well just eat 100 calories of sugar. They replace avocados, fruits, and nuts with nutrient void foods to “reduce” calories. What do we mean by low calorie? Most diets require over 22,000 calories to supply all the essential micronutrients. If you’re eating less than that, and are following something like the USDA diet or the South Beach Diet, you’re deficient in nutrients. Farm raised animals are fed primarily corn and soy. These are calorie rich grains which fatten up the animals quickly, but they are low in nutrients. They also cause a dangerous imbalance in the essential Omega 3 and Omega 6 fatty acids. Pesticide-treated vegetables are lower in phenolics than organic ones. This is because polyphenols are produced as a defense against bugs and pathogens. When there is no reason to defend themselves, the plant stops producing polyphenols. There is pesticides. This is despite sometimes being contaminated anyway. It should be mentioned that many studies show organic foods are not higher in nutrients. However, that’s going by the USDA definition of organic – not “organic” that you would find in your back yard. Fresh fruits and vegetables grown at home in well fertilized soil are going to be higher in nutrients than USDA organic versions. GMO foods (primarily corn and soy) are resistant to glyphosate – the RoundUp herbicide. So these crops are heavily sprayed with glyphosate to kill the weeds. Glyphosate chelates minerals in crops on which it is sprayed. It remains to be seen how much of an impact this effect has, but it’s safe to avoid GMO foods for a variety of other reasons. Compared to grass-fed meat, grain-fed meat is abysmally low in antioxidants, micronutrients, fatty acids, minerals, and vitamins. Grains are not a food for humans or herbivorous animals. When herbivores are fed grains, they become malnourished, just like humans. Grain-fed meat and farmed seafood can also serve as a carrier for more toxins, which increases nutrient needs. If it isn’t labeled Organic meat, then it has been fed GMO grain. But even organic meat just means the animals were fed organic corn and soy, so only slightly better than conventional. Look for the grass fed means, range fed chickens, wild caught fish, etc. If you eat salmon, which you should, look at the ingredients on a farmed salmon, often called Atlantic Salmon. It will say salmon and food coloring, or food collaring added to the feed. This is because salmon fed grains is white, not pink. So they add food coloring to the salmons feed to turn it pink. Worse yet, like land animals, farm raised salmon have very little of the protective omega 3 oils and high levels of the oxidizing omega 6. So the benefit of salmon, the rich omega 3 oils is lacking in farm raised salmon. This applies to tilapia, shrimp, etc. The majority of nutrients in milk are found in the fat (cream). When you remove or reduce the fat, you are removing and reducing the nutrient content. Pasteurization destroys some of the nutrients in both skim and full fat milk. Conventional dairy is also high in aflatoxin and other mycotoxins that were in the cattle’s feed. If you eat grain-fed meat or conventional dairy – supplementation is a good idea. Your body needs nutrients to deal with toxins. When more toxins are present, you need more nutrients. If you’re living in a cave or the garden of Eden, this will be less of a concern. If you’re like the rest of us mortals – you’re exposed to a litany of toxins on a daily basis. Our bodies weren’t designed to deal with these toxins using only nutrition from food. So if you plan to get your nutrition only from food, you should plan to avoid all toxins. Good luck with that. Athletes often think tons of exercise is the key to a long and healthy life. Professional athletes and their trainers are among the first to denounce supplementation as risky because of the risk of contaminated or adulterated supplements. I don’t advocate high amounts of exercise, but this is an important point. If you’re doing enough exercise to substantially deplete energy reserves, you’re also using more nutrients for energy production and recovery. As a result, athletes are at an even higher risk of nutrient deficiencies. Since many athletes eat a low nutrient, high toxin diet – this is a serious concern. Aging is a natural process, but it’s not fun. If there are supplements than can delay this process, why not take them? As long as there isn’t an undue risk of harm, it’s hard to justify avoiding a substance simply because our ancestors didn’t have access to it. There is good reason to believe a higher intake of nutrients may prolong life. Our hunter-gatherer ancestors may have been malnourished at certain times which is not beneficial. If supplements can buy you a few more years of quality life, why not take them? Whether we like it or not, sometimes supplements are cheaper than real food. In the case of something like salmon, it may be better for you to supplement with a high quality fish or krill oil than to settle for a farmed variety. Farmed salmon is low in omega-3s and high in toxins. Farmed salmon are higher in parasites and bacteria. In order to hide the sickly appearance of farmed salmon meat, the fish are fed a pink pigment to change their tissue color. Farmed salmon contains 16 times more PCB’s and pesticides than wild. Wild salmon is often more expensive than grass-fed beef, and presents more of a health risk than benefit. Grass-fed beef has enough omega-3’s by itself, but supplementation may be a good idea for some people (like kids). We live in a stressful, toxic world, and it’s a normal, healthy, optimized human behavior to understand the toxins and counteract them whenever possible. Hiding your head in Paleo-sand won’t make the effects of these toxins go away. Neither will eating some vegetables. The idea that you can get all your nutrients from food is fine in theory, but virtually impossible in practice. Soil and water depletion, food and environmental toxins, poor absorption, pesticides, exercise, and lack of calories can all cause nutrient deficiencies. There is evidence that consuming nutrients from food is more beneficial than supplements, which is why you should focus on a nutrient rich diet first. However, it’s rarely enough. Do you think supplementation is necessary for optimal health? Commercially grown produce is typically fertilized with only potassium, nitrogen, and phosphorus. This is all that is needed to grow large plump produce, and since fruits and vegetables are sold by the pound, this makes financial sense to the farmer and retailer. These are the key minerals to form the plant cells, but the calcium, selenium, iron, boron, copper, etc are depleted from the soil with each growing season and they aren’t replaced. Just one piece of evidence pointing to the need to supplement your diet with a high quality multivitamin. So still enjoy a good organic apple, but you’ll need help more help to keep the doctor away. Minerals initially come from the earth. So in theory you could eat dirt and get all the minerals you need. But unfortunatly the minerals in dirt are in a from that we can’t readily absorb (low bioavailability). Plants though can pick up those minerals in the soil and bind them into organic compounds in their fruits, leaves, seeds, etc. this is called chelation. Then when we eat that fruit or vegetable we also bring in those chelated minerals, and since they are part of organic compounds that our bodies are looking for, they are readily absorbed. If you’re looking at your supplements label how do you tell which it has? Simple is to look at the name. For example if it ends in “ide” like magnesium chloride or calcium chloride, then it is a mineral salt as found in dirt. One exception is Iodine – you’ll often see that as potassium iodide. What you want to look for are minerals in a supplement which are “Chelated” minerals . These will often end in the “ate” such as chromium picolinate, calcium citrate, calcium carbonate, zinc citrate, copper glutamate, etc. Here is an earlier post I wrote which goes into more detail Dirt Has All the Minerals You Need. Like minerals, there are different forms of some vitamins. As you can guess, then cheaper forms have lower bioavailability than the more expensive forms. The key one you’ll find is Vitamin E. The nature form of vitamin E, as found in nature and much more bioavailability is d-alpha-tocopherol. The cheaper, and less absorbable form is dl-alpha-tocopherol. note the difference is the beginning is either d- or dl-. Both are vitamin E, but the d- form is much more absorbable. the dl- form is the same molecular structure, but just put together slightly differently. Imagine a stack of legos as the d- form. Then take off the single top rectangular block and turn it 90 degrees to the left. that is the difference in the dl- form. Like in the two previous sections, manufacturing cost comes into play. The more tablets per hour a manufacture can press on a very expensive piece of equipment, then lower the per tablet, or per bottle cost is. So how do they increase the production speed? Simple press the ingredients in the tablet under much higher pressures so they can fly down the line faster without breaking. The product I use and recommend tests the dissolution time of their tables during manufacturing every 30 minutes to insure they dissolve within 30 minutes. I’ve toured other plants where they never test the dissolution time. Do they insure there isn’t anything in the tablet that shouldn’t be in it such as heavy metal contamination, bacteria, insect parts, etc. Here is an article that explains How to find a high quality supplement. What is Vitamin A (From Beta-Carotene)? This is the first in a series of nutrients from A to Z. Starting off we’ll look at Vitamin A.
Carotenoids, like beta-carotene, comprise a diverse class of antioxidant molecules that help protect the body from oxidative damage. Approximately 700 natural carotenoids have been isolated and characterized. Most are derived from plants, where they serve multiple functions: photosynthetic pigments, photoprotectants, and free radical scavengers. Some 50-60 carotenoids are present in a typical diet with the major sources being fruits and vegetables. Beta-carotene is one of the best known carotenoids, likely because: (1) it is one of the most abundant in a typical adult diet, and (2) it provides two nutritional functions – in addition to its role as an antioxidant, the human body converts beta-carotene into vitamin A. Other members of the antioxidant carotenoid family include alpha-carotene, cryptoxanthin, zeaxanthin, lutein, and lycopene. Unlike beta-carotene, most of these nutrients are not converted to vitamin A in significant amounts. Beta carotene’s role as an antioxidant is based on its extensive system of conjugated double bonds which, upon reacting with an oxygen atom, absorb and diffuse that oxygen’s potentially destructive energy. The oxygen atom returns to a lower energy state, and beta carotene dissipates the absorbed energy harmlessly (as heat). Similar mechanisms are involved in quenching the oxidative potential of hydroxyl radicals and other free radical compounds. As provitamin A, beta carotene contributes to an entirely different set of functions by supplying a portion of the body’s requirement for retinol (vitamin A). In fact, a single molecule of beta-carotene can be cleaved in the body to produce two molecules of vitamin A. Other carotenoids (including alpha-carotene, gamma-carotene, and cryptoxanthin) provide provitamin A activity, but yield only one molecule of vitamin A when metabolized. Retinol (vitamin A) is an essential nutrient associated with three important functions, the best-defined of which involves human vision. Retinol is a functional constituent of rhodopsin, a protein located in the retina of the eye that absorbs light and triggers a series of biochemical reactions that ultimately initiate nerve impulses, resulting in sight. Secondly, vitamin A is involved in the activation of gene expression and the control of cell differentiation. It is through this function that vitamin A affects immune function, taste, hearing, appetite, skin renewal, bone development, and growth. Vitamin A’s third role involves control of embryonic development. Here it is thought that retinoic acid modulates the expression of certain genes that govern patterns of sequential development of various tissues and organs in the body. Vitamin A deficiency is a major public health issue, particularly in developing countries. It has been estimated that 500,000 preschool-age children worldwide become blind each year as a result of vitamin A deficiency. Millions of others suffer from night blindness, a common clinical sign of inadequate vitamin A intake. Further estimates suggest that more than 100 million children worldwide suffer from vitamin A inadequacy without showing clinical signs of acute deficiency. Beta-carotene is known to be an effective dietary cure for vitamin A deficiency and an effective remedy for symptoms of this disorder. Epidemiological studies support long-term beneficial effects of beta-carotene intake on a number of degenerative diseases. For example, the relationship between beta-carotene intake and cancer has received considerable attention in recent years. Epidemiological evidence suggests that long-term intake of dietary beta-carotene may reduce the risk of several types of cancer. Similar findings pertain to heart disease and immune health. Dietary sources rich in beta carotene and other provitamin A carotenoids include carrots, broccoli, yellow squash, corn, tomatoes, papayas, oranges, and dark green leafy vegetables like spinach, kale and Chinese cabbage. Beta-carotene is heat stable, so it is not degraded during prolonged boiling or microwaving. Although ingestion of too much preformed vitamin A (retinol) can be toxic, excessive intake of beta-carotene is not known to induce vitamin A toxicity. Negative feedback mechanisms in the body prevent the over-conversion of beta-carotene to retinol. However, high levels of beta-carotene in the diet can induce hypercarotenosis, a benign condition characterized by a jaundice-like yellowing of the skin. Symptoms are reversed when dietary intake is reduced. Because of the danger of excessive vitamin A, as retinal, which can be toxic, if you take supplements they should be as beta-carontene, not retinyl acetate or retinal palmitate. Expecting mothers will be warned by their doctors to limit the intake of Vitamin A to avoid harming the fetus. I’ve recommended a top rated pre-natal supplement to clients who are expecting which has 15,000 IU of vitamin A as beta carotene. Their doctors have reviewed the label and cautioned about the level of vitamin A. What most medical doctors don’t understand is that vitamin A as beta carotene does not have any risk of toxicity as explained in the preceding paragraphs. So if you are expecting make sue your doctor understands the difference. Want a new body? You can have one. There are some which turnover very slowly like nerves, but aside from those you have a whole new body every couple of years, and much is only a few months old. So that was some interesting trivia, but does it really matter? Yes it does. As your body replaces skin, blood, muscles, organs, etc. they are built from what you eat, so like the old saying You really are what you eat. If you eat the best foods and take the best supplements then you’re body will become better and healthier day by day. If on the other hand your diet isn’t that good and you don’t supplement, then you’re cells will still renew, but if a nutrient they need isn’t available then it just builds without it, or substuties, or takes it from someplace else, like your bones. Your skeleton is your bodies store for calcium, but your body also needs calcium for muscles to move and for nerves to carry messages between the brain and every body part. In addition, calcium is used to help blood vessels move blood throughout the body and to help release hormones and enzymes that affect almost every function in the human body. So if you’re cells need calcium for more important functions like moving blood, then you’ll rob the calcium from your bones to support your circulatory system, and you’ll be on the road to osteoporosis. Diseases are often though of as something going wrong, but many diseases can also be the result of a nutritional deficiency. We all know of scurvy, which plagued early sailors, is caused by a lack of vitamin C. Other diseases though there isn’t such a clear connection. Essential fatty acids, like fish oil, are essential for brain health, but there isn’t a disease that is directly caused by too little fish oil, though many conditions can get better with fish oil like postpartum depression, ADHD, anxiety, and others. So back to where I started, if you eat a healthy diet and take some excellent supplements (Not the ones you get at Costco, the grocery store, or even GNC) your body can rebuild itself with every cell of your body becoming as healthy as it can possibly be. Give it 6 months and you literally will feel like a new person. I had a friend call the other day and ask if they could just purchase the Chelated Minerals product alone? The product we recommend consists of two bottles in one box. One labeled Chelated Minerals and the other Mega Antioxidant. I asked why they didn’t need the Mega Antioxidant. He said that they’d been approached by a friend who was selling a product which was, they claimed, the most potent antioxidant available and he didn’t need any other antioxidants. So they decided to use this product for their antioxidants and just ours for the minerals. The mistake that many make is thinking that an antioxidant is one thing. There are hundreds or thousands of different antioxidants. Many common vitamins are potent antioxidants and also critical for life. Take vitamin C, if your diet lacks vitamin C, you’ll develop scurvy. Vitamin C is a very potent water soluble antioxidant. Vitamin E is a very potent fat soluble antioxidant. Beta Catoteen (a precursor of vitamin A), lycopene (from tomatoes), lutien, zeaxanthine, etc. are also antioxidants and each has an impact on different parts of the body. For sample the last two are predominantly found in the eyes and protect your eyes from oxidative damage from UV rays. Many vitamins are antioxidants and essential for life – if you don’t get them you die. If you don’t get enough you get sick. Ricks, scurvy, beri beri, plegura are all diseases of vitamin deficiency and they are antioxidants too. Even minerals like Zinc can be antioxidants. And just about every colored fruit and vegetable. First though, lets understand what an antioxidant is – An antioxidant is a molecule that inhibits the oxidation of other molecules. Oxidation is a chemical reaction that transfers electrons or hydrogen from a substance to an oxidizing agent. Oxidation reactions can produce free radicals. In turn, these radicals can start chain reactions. When the chain reaction occurs in a cell, it can cause damage or death to the cell. Antioxidants terminate these chain reactions by removing free radical intermediates, and inhibit other oxidation reactions. They do this by being oxidized themselves, so antioxidants are often reducing agents such as thiols, ascorbic acid, or polyphenols. An old car rusting or an apple turning brown are examples of oxidation. To illustrate with a simple analogy look at your fireplace (a real wood burning one). The fire is very similar to what fuels your cells. Occasionally though the fire pops out a spark, when that lands on the carpet in front of the fireplace it makes a little burn mark. Over time the carpet becomes more burn marks than carpet. Each spark is in essence a free radical flying out of the fire and damaging the carpet. In your body though, those sparks damage cell membranes, DNA, turn harmless cholesterol sticky and make it bad, etc. So an antioxidant is like putting a screen in front of the fire. It stopes the sparks from flying out of the fireplace and causing damage. So back to my friend. He had been sold a product which had a single antioxidant in it, but it didn’t have any antioxidant vitamins, nor did it have a variety of antioxidants, just one. Sure it may be powerful, it may even be the most potent antioxidant there is, but it is only one. Your body needs dozes or hundreds of different antioxidants. Some are fat soluble, some are water soluble, some are also essential vitamins and minerals. Some work in your eyes, some in your blood, others in the cell membranes and in your brain. What was my advice? Yes, it may be a good antioxidant, but it doesn’t replace all antioxidants, so add it to a diet rich in colorful fruits and vegetables, continue taking a multi with all the essentials vitamins and minerals. Antioxidants are a huge market, walk down any grocery store aisle and you’ll see packages touting they are rich in antioxidants. There are dozens or hundreds of products being pushed on people that are supposedly the ultimate antioxidant. Even though the marketing claims that it is the most potent antioxidant product there is, it can’t replace the antioxidant vitamins, minerals, and foods rich in a multitude of antioxidants. As a foot note, there are a couple of companies which use a device you put your finger in to supposedly measure the level of antioxidants in your body. Yes it does measure an antioxidant, it only measures the level of beta-caroteen in your skin. Beta-caroteen is just one antioxidant of hundreds or thousands, so it does indicate one measure, but far from conclusive – That is like gauging the mechanical health of your car by measuring the tread depth of just the right front tire.